Frankie Forearms, from Rise & Destroy, has been running around the Arcanum for a while now. Yesterday, Community Managers announced on KingsIsle Live that they would give us a heads-up on how to get it as a pet in Wizard101. Now through December 21st 2015, at 11:59pm US Central time, you can get a free Frankie Forearms pet in Wizard101 when you play KingsIsle's newest mobile game, Rise & Destroy! After completing Level 3, you will get a message in the Rise & Destroy in-game mailbox with your free pet code within 24-48 Hours. 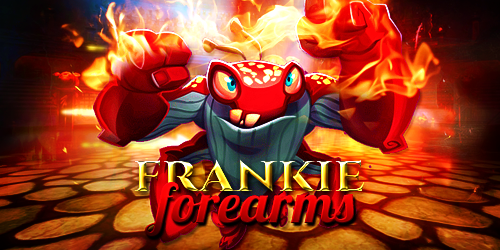 If you have previously played Rise & Destroy and beaten Level 3, you will still receive a free Frankie Forearms pet. Please, allow 24-48 hours to get your free pet promo code in the Rise & Destroy mailbox.